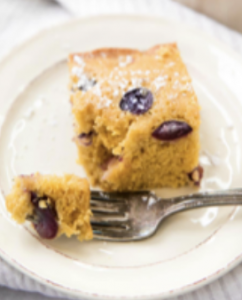 A simple, rustic grape cornmeal cake recipe with fresh Jellyberry grapes from Divine Flavor. Bake this yummy, delicate, lightly sweet cornmeal cake and watch it disappear! Preheat oven to 350°F. Prepare an 8×8″ baking pan with nonstick cooking spray. Whisk 1/2 cup plus 2 tablespoons flour, cornmeal, baking powder, and salt in a large bowl; set aside. Whisk eggs, milk, sugar, lemon zest, and vanilla in a medium bowl to combine. Add oil; whisk to blend. Add egg/oil mixture to the bowl with flour and stir to combine. 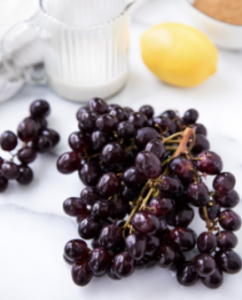 Toss about 3/4 cup of the grapes with about 1/2 tablespoon flour in a medium bowl until well coated. Gently stir grapes into batter. Pour batter into prepared pan. Bake for about 5 minutes. Remove from oven and scatter remaining grapes over cake. Push them partially into the cake. Finish with a sprinkle of about 2 tablespoons turbinado sugar (optional). Continue to bake until top and sides are golden brown and cake springs back when pressed, 25-30 minutes longer. Transfer to a wire rack. Let cool slightly in pan. Serve warm or at room temperature.